This past week, AJ Styles beat Magnus and won the “Bound For Glory Series” to earn a shot at the World Heavyweight Championship! 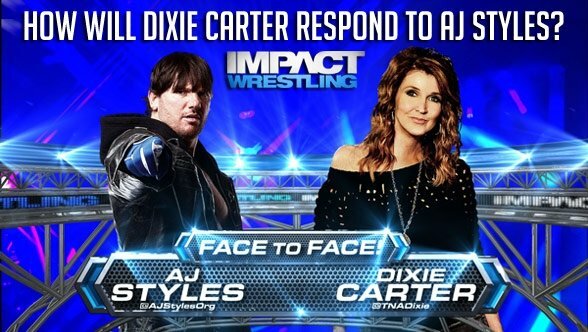 AJ is set to face Bully Ray in the main event at October’s “Bound For Glory” – but what about AJ’s comments directed towards TNA President Dixie Carter after the match? What does AJ have planned? How will the TNA President react? Best Case Scenario: A.J. cuts right to the chase, and rather than reading off the litany of bad angles he’s been part of since Hulk Hogan’s arrival, jumps directly into explaining to Dixie why he’s going to be the best thing to happen to the TNA World Heavyweight Title and the worst thing to happen to Bully Ray. He states that his mission is to regain the title and become the greatest wrestler in TNA history. Worst Case Scenario: A.J. makes a series of supposedly-cutting worked-shoot comments directed at Dixie and Hulk Hogan which make a small, stupid portion of fans ooh and ahh but do nothing for TNA, their title, or the idea that wrestling is anything more than a soap opera written by petty, jealous middle-aged men. Dixie gets all “a very special episode of Blossom” with her acting and cries tears that would make Big Show blush. Dave Says: A.J. Styles is the number one contender for the World Heavyweight Championship headed into Bound For Glory. Impact Wrestling fans should be able to get excited about that. The only problem is that rather than telling the simple, time-tested “good vs. evil” or “road to redemption” stories, TNA has chosen build A.J.’s run at the title around the worked-shoot idea that he is getting back at owner Dixie Carter and Hulk Hogan for pushing him out of the main event and turning their backs on him. Wait, isn’t he wrestling Bully Ray..?